What does 'Me too' mean? 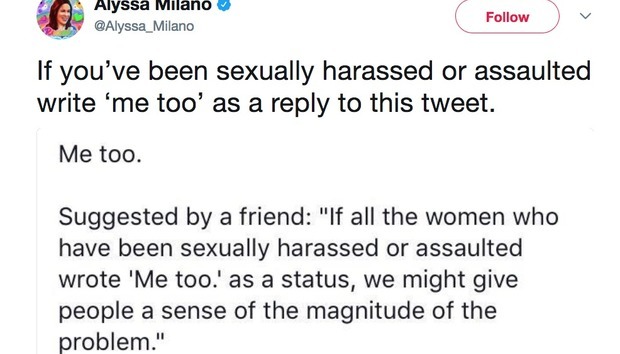 The words 'Me too' when written as a social media post mean that person has been harassed or sexually abused. It's a brave message to post, and intended to give a sense of the magnitude of the problem. Thus seeing those two little words pop up all over social media - and particularly the pages of your closest friends and relatives - can be rather harrowing. The 'Me too' Facebook campaign follows serious allegations made about film producer Harvey Weinstein; the NYPD and Met Police are currently investigating multiple cases of sexual assault that allegedly took place between the late 80s and 2015.